There are a lot of misconceptions about bears. “Grizzly bears can’t climb trees,” or “bears can’t run downhill” – both untrue. One common misconception is that bears have poor eyesight. The reasons behind this misconception are understandable, but evidence indicates that bears’ eyesight is comparable to ours. 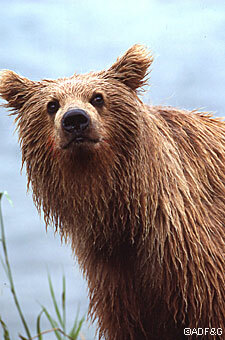 “From my experience bears can see very well at a distance, at least as well as humans,” said biologist Harry Reynolds. Reynolds is a bear biologist for the Alaska Department of Fish and Game in Fairbanks and serves as president of the International Association for Bear Research and Management. He’s worked with bears for 45 years. Reynolds and another biologist once observed a large adult male grizzly that had killed and was eating a 2-year-old grizzly in the western Brooks Range. Zookeeper Lee Huntsman operates a privately owned animal park just south of Cleveland, Ohio. He has 240 animals – 60 different species – including black bears and Syrian bears, a kind of Asian grizzly. He’s worked with 30 different bears over the past 10 years. Like many animals, bears’ eyes have a reflective layer called the tapetum lucidum lining the back of the eyeball. This layer reflects light back through the retina, allowing light to stimulate light-sensitive cells in the retina a second time, thereby improving night vision. This is what gives dogs, cats and many nocturnal animals that distinct, bright eyeshine when they are flashed with a light at night. Polar bears have special adaptations that help them to see underwater. Like many other marine mammals, they have a clear inner “eyelid” called a nictitating membrane that protects their eyes and serves as a second lens when they are underwater. John Hechtel has spent decades observing bears in the wild and studying behavior, hibernation, and bear and human interactions. A state biologist in Palmer, he’s worked with bears throughout Alaska and the Yukon. 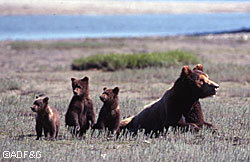 Hechtel emphasized that just like with people, there is variation among bears. From his experiences, Hechtel has the impression that seeing silhouette and movement is an important part of bears’ distance vision. There isn’t a lot of research on the topic of bear vision, Hechtel said, and stories range from incidents where bears see extremely well to stories where bears seem nearly blind. Hechtel said most misconceptions about bears are born of limited experience and assumptions. A person will assume that because a bear didn’t respond to them, it didn’t know they were there. That bear may have smelled the person – and saw them – long before the person was aware of the bear. Biologists stress that by far, bears’ keenest sense is their sense of smell. Hechtel said even when a bear does get a good look at something, it still likes to test it with its nose. Hechtel thinks that’s contributed to the misconception about bears’ eyesight. Bears are so well informed about their environment because of their sense of smell that they don’t appear to put much emphasis on their vision. Bears trust their noses more than their eyes, just as humans trust their vision more than their sense of smell. Larry Aumiller is the manager of the McNeil River State Game Sanctuary. For 28 years, he’s spent summers with brown bears at the sanctuary, 180 miles southwest of Anchorage. He recalled an incident one spring where a large adult male was following a female in estrus. In Aumiller’s experience, he thinks bears see on a par with humans up to about 120 yards, and beyond that their vision drops off. He’s found it’s easy to stalk a bear at longer distances, especially if you are careful about using cover and disguising movement. Hechtel said over time, our insights should get better as scientists address some of the unanswered questions regarding bear vision.